The large town of Gateshead lies on the southern bank of the river Tyne and is home to roughly 200,000 people. Evidence of the multicultural nature of Gateshead society can be found in the many churches of every denomination, the Gateshead Yeshiva and numerous other Jewish educational institutions and the two mosques in the Bensham area that serve the Muslim community. There is also a significant amount of the population that are non-religious. Of the approximately 11 funerals directors in Gateshead, most will be equipped to handle funeral arrangements and customs traditionally practised by the various religions. St Georges Church in Durham Road and St Patricks R C Church in High Street are just two popular Christian funeral venues. Funeral directors in Gateshead will be able to advise on cemeteries and crematoriums that will accommodate a variety of needs. Although places like East Cemetery no longer has burial plots available, many deed holders are choosing to inter cremated remains of loved ones in family graves situated here. The Heworth Burn Cemetery, however, does still offer burial sites for purchase. Special requirements such as a natural burial or eco-friendly funeral transport can be provided by most funeral directors in Gateshead and they will provide all of the information necessary to fulfil a loved one’s wishes. 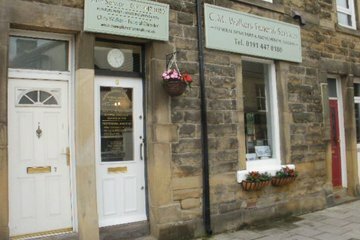 Search for local Gateshead funeral directors now to see funeral homes near you. You can filter search results by best rated, most reviewed or nearest to you. Click on a funeral director’s listing to see their profile page, where you can read independent customer reviews, search for recent obituaries, and learn more about the funeral services they can offer to you. i cant thank chris enough for everything he did for my dad, and for us as a family. Hes just a genuine guy who listens to your wishs, and accomodates them. Would highly recommend him , to anybody . Hes made a devasting time alot easier when it comes to funeral arrangements . I would 100% recommend CM Walkers Funeral Service. Chris was very professional and helpful from the start. I am more than pleased with the service he provided for my Dad and me and all the family are very greatful.. Thank you Chris for making a very difficult time a little bit easier .